We make buying a diamond as clear-cut as buying any other traditional asset. Australian Diamond Portfolio offers a comprehensive process to ensure you get your diamond portfolio started the right way. 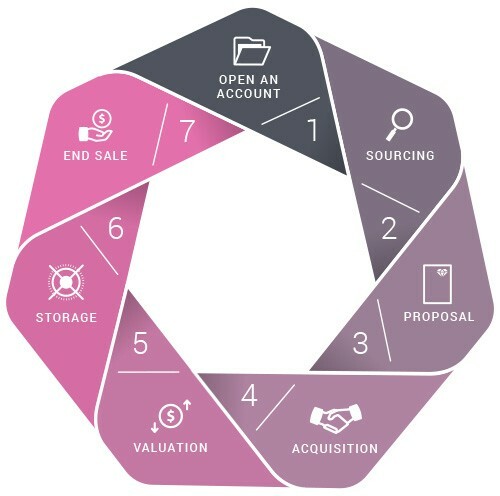 From your first exploratory enquiry where you decide if this investment is right for you, through to sourcing, buying, storage, and later selling, we provide the end-to-end solution. Creating an account at Australian Diamond Portfolio is free – both to open and to maintain, with no hidden fees. There is also no obligation for you to buy immediately, though once it is open you can join our complementary investor insight workshops, request a formal investment diamond proposal, regular consultations, product & market updates, and a variety of other value-added services. As a brokerage, we act as your agent to locate and acquire the most appropriate investment diamond(s) matching your specified level of investment. Your Investment Diamond Advisor will present you with a formal proposal once we have selected a diamond, which includes all specifications, image(s), relevant certification, and historical performance analysis. We will work with you to ensure you have a comfortable understanding of the proposal, and once it meets your approval we will complete the acquisition process. For your peace of mind, Australian Diamond Portfolio submits every diamond acquired to the Diamond Certification Laboratory of Australia (DCLA), the only internationally recognised laboratory in the country, for independent verification and a valuation report. Australian Diamond Portfolio offers each client one year of complimentary vaulting at Guardian Vaults, a private high-security safe deposit facility with locations in Sydney and Melbourne. As an additional service, we are also able to arrange insurance underwritten by Lloyd’s of London. You have the option to attend the Vault yourself in person to set up your account and take possession of your diamond and safety deposit box, or, for your convenience, you may authorise Australian Diamond Portfolio to store the diamond in your box on your behalf for no additional cost. You may also choose to simply take physical delivery of the diamond for your own private reasons, collecting your diamond in person. Alternatively, Australian Diamond Portfolio can arrange to securely courier it to you. Australian Diamond Portfolio will assist you in marketing all or part of any diamond portfolio opened with us, helping find the best route to market depending on the individual diamonds you are seeking to sell.